MIGEON, J. - Amérique Septentrionale. Amérique Septentrionale. - MIGEON, J. Size : 11.0 x 14.8 inches. / 28.0 x 37.7 cm. 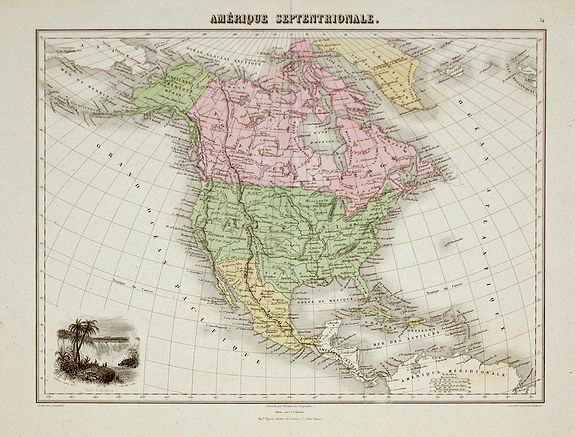 Description :A nice map of the continent showing the national boundaries, but not the individual states and provinces. The United States is shown with its boundary with Canada completed but the region is marked Oregon ou Columbia reflecting the recently settled dispute between Britain and the U.S. The boundary with Mexico is marked Limite d' apres le Traite de 1848. Alaska is marked as Amerique Russe. Numerous Indian nations are located throughout. The most interesting feature of the map is the vignette (uncolored), Chute du Niagara. This unusual view of Niagara Falls, drawn by Frederic Legrip, features the great falls surrounded by palm trees. Vignette engraved by Schroeder, map engraved by L.A. Sengteller. From Géographie Universelle, Atlas Migeon. published by J. Migeon : one of the last decorative atlases published in the 19th century.